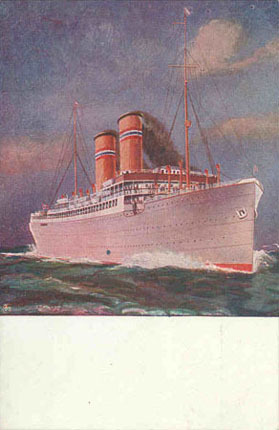 This page is devoted to postcards of passenger ships of the Norwegian America Line (NAL). An alphabetical list of ships shown on this page is shown below. The Table beneath gives links to complete postcard history pages on selected individual ships. Below the table are official postcards of the fleet in chronological order. 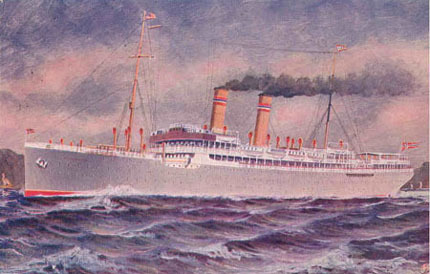 Norwegian America Line (Den Norske Amerikalinje A/S) was formed in 1910, during a period of rapid growth in the Norwegian shipping industry. In 1911, orders for two 11000grt liners were placed with Cammell Laird of Birkenhead, for delivery in 1913. These became the Kristianiafjord (1) and Bergensfjord (1), which established the suffix "-fjord" in the NAL fleet. 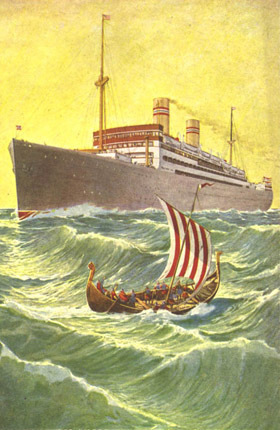 They were extremely successful, taking much traffic from the DFDS Scandinavian-America Line. 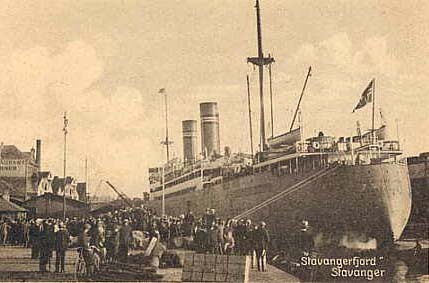 A third ship was ordered from the same builders, but the war delayed delivery of Stavangerfjord until 1918. 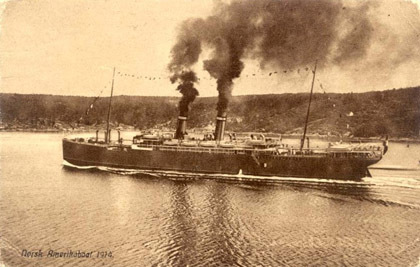 Kristianiafjord (1) was lost due to grounding in 1917. 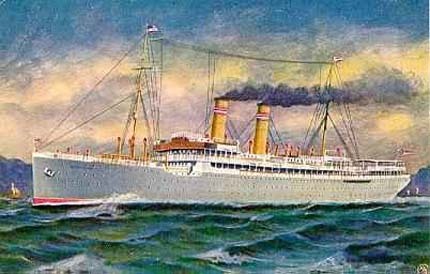 Following the First World War, NAL expanded rapidly with new cargo-liners constructed in the UK and Canada - by 1923 they had 19 vessels. The economic collapse of the 1920s depression hit the company, and emigration largely ceased following new US laws. 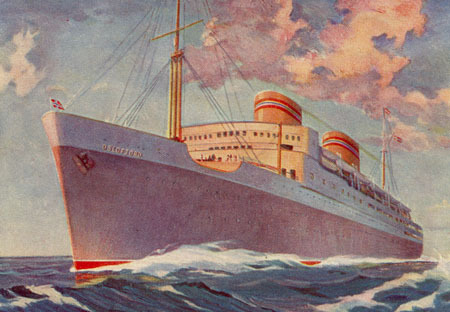 In 1925, the first NAL cruises were operated to the North Cape, Norwegian fjords, Scotland, Iceland and the Baltic. 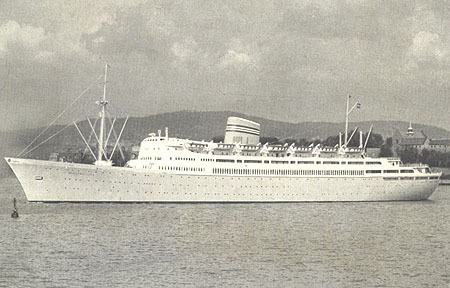 Fortunes improved in the 1930s, and a new passenger ship, the Oslofjord (2) was delivered from a German yard in 1938. Her life was short, however, since she was lost to a mine in 1940. 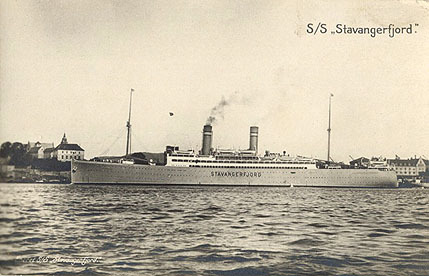 Most of the other recent cargo ships were also lost in the Second World War, and a further expansion programme was necessary in the late 1940s, which included the Dutch-built in Oslofjord (3) 1949. 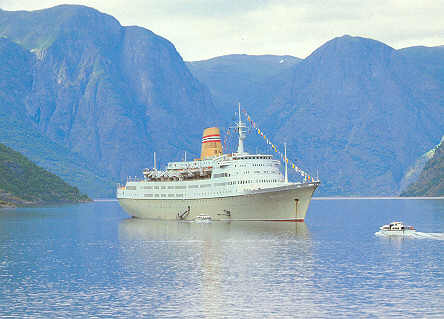 She was followed by three further superb passengers ships, culminating in the Vistafjord (3) of 1973. 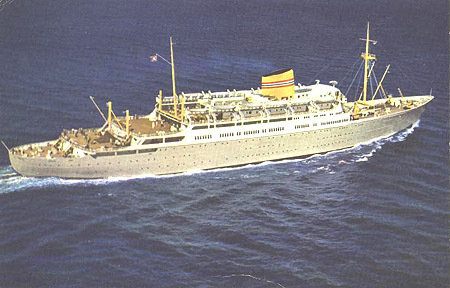 The highest number of transatlantic passengers carried by the line was 25400, in 1956. 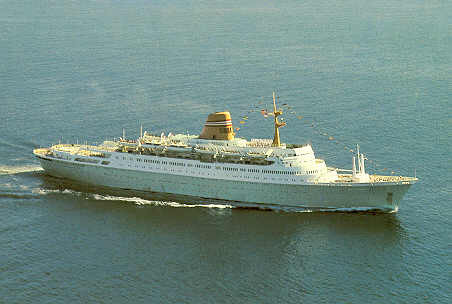 Numbers declined thereafter, and the Sagafjord of 1965 was virtually 100% cruise ship. 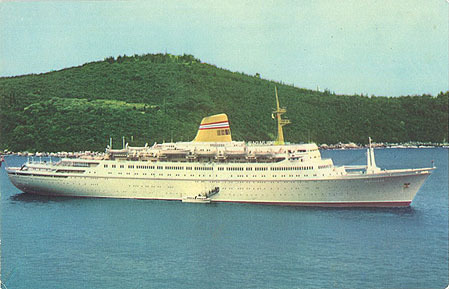 Both cargo and cruise services operated a loss in the late 1970s, and both were re-structured, with the remaining two cruise ships passing to a new company, Norwegian America Cruises in 1980. 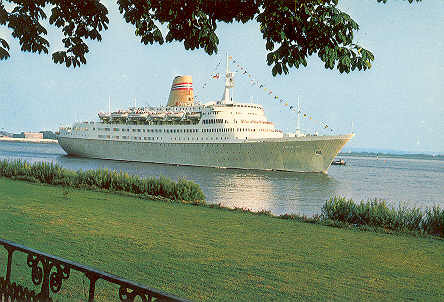 The two ships were sold to Cunard in 1983/84. 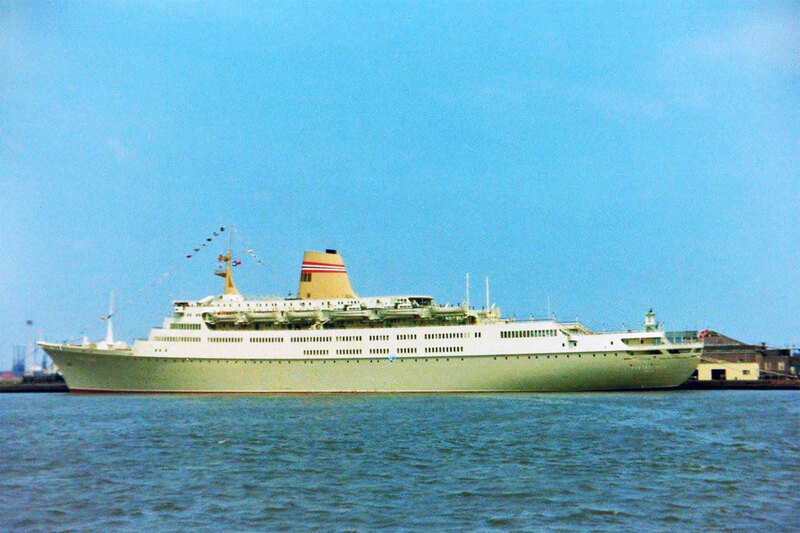 Costa Line - Linea "C"
Kristianiafjord (1) was the first of two sisterships delivered by Cammell Laird. In appearance, she is identical to Bergensfjord (1), shown below. 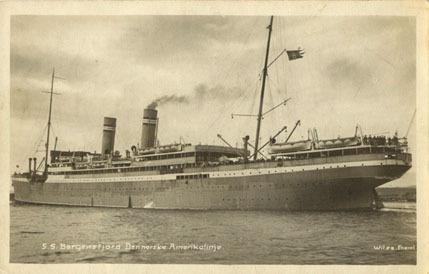 Official NAL postcard of Bergensfjord (1) or Kristianafjord. Postcard of Bergensfjord (1) or Kristianafjord. Bergensfjord (1) was delivered by Cammell Laird, Birkenhead, England, in September 1913. She was a sistership to Kristianiafjord (1). 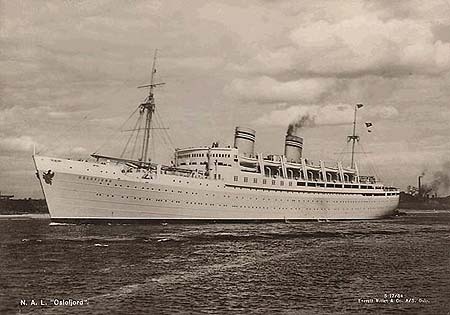 She operated as a troop ship during World War Two, and was returned to NAL in 1946. 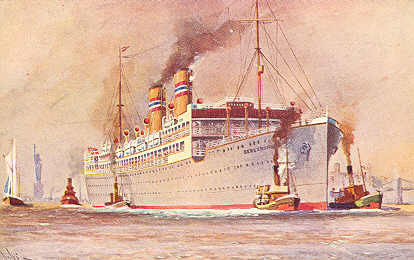 They immediately sold her to Panama Lines for use as an emigrant carrier to South America as the Argentina, passing to Home Lines in 1952. 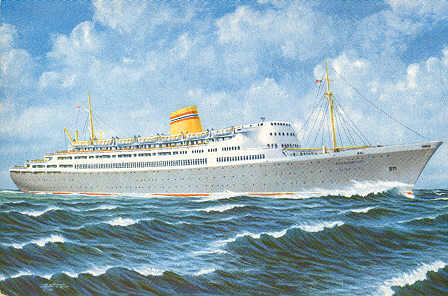 In 1953 she was sold to Zim Lines as their Jerusalem, for use on Israel-New York services. 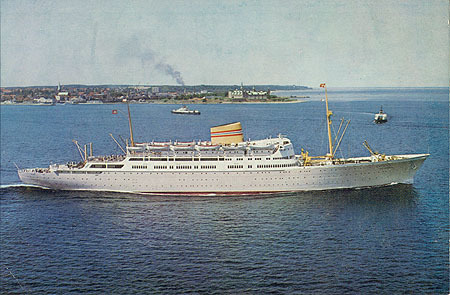 In 1957 she was renamed the Aliya, and was scrapped in 1959. 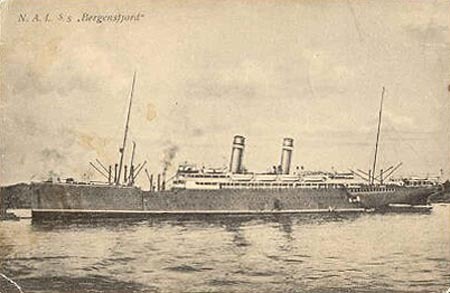 Official NAL postcard of Bergensfjord (1). A scan of an interesting postcard of Bergensfjord (1) or Kristianiafjord (1) supplied by Michael Kenyon. The card was written on 29/04/1914, but does not say which sister ship they were on. Norsk Sjofartsmuseum model of Bergensfjord (1). 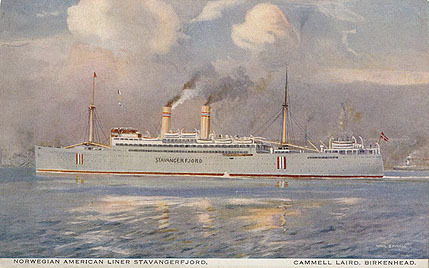 Stavangerfjord was built by Cammell Laird in Birkenhead, like her two predecessors, and entered service in 1918. She was captured in Oslo by the Germans in 1940, but remained there in use as a troop depot throughout the war. 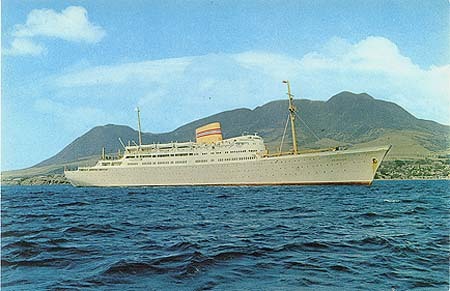 After the war, she continued on NAL North Atlantic services until 1964, when she was sold for scrap. 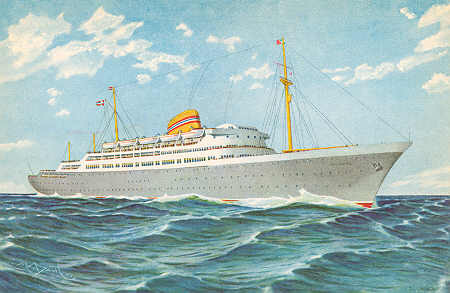 Company official postcard of Stavangerfjord. 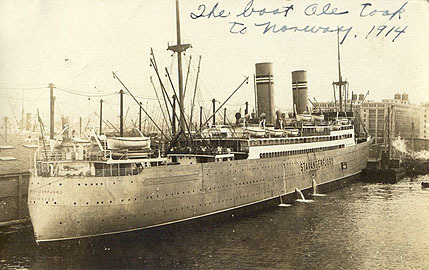 Postcard of Stavangerfjord at Stavanger. Stavanger Sjofartsmuseum postcard of Stavangerfjord at Stavanger. Stavangerfjord was rebuilt with shorter funnels in 1937. Company official serial E.M.11-57, posted from Norway to Wisconsin in 1962. Wilse Photo postcard serial 1236c of Stavangerfjord in Olso, after rebuilding. 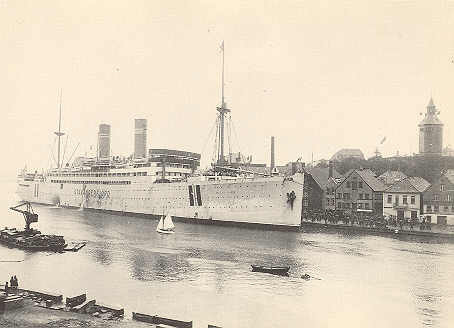 Wilse Photo postcard of Stavangerfjord in Olso, after rebuilding. 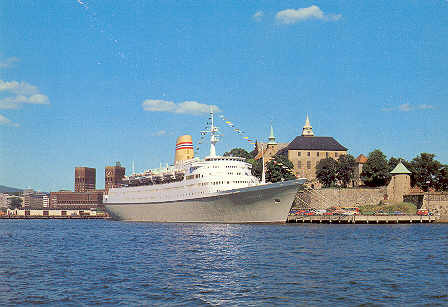 Official NAL postcard of Oslofjord (2). Photographic postcard S17/04 of Oslofjord (2). 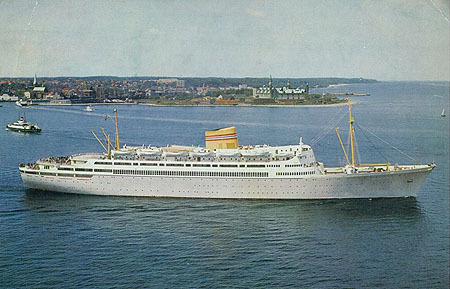 Oslofjord was built in Amsterdam in 1949. Oslofjord was 16844grt and carried 266 First Class and 359 Tourist Class passengers. 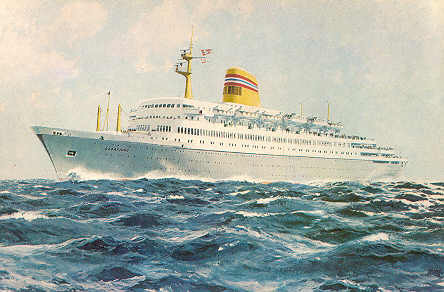 In 1966, unsuccessful negotiations were made to sell her to Finnlines. 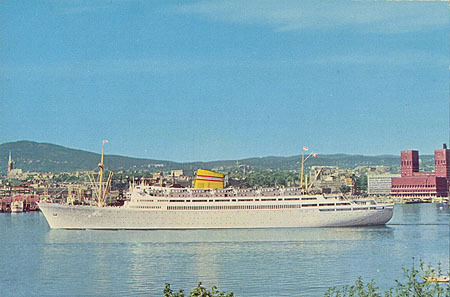 In 1967 Oslofjord was refitted, and was chartered to the Greek Line in 1967-68. 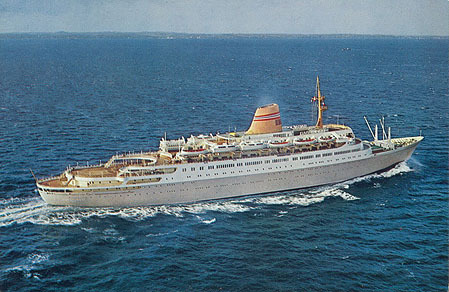 Costa Line chartered the Oslofjord in 1969. 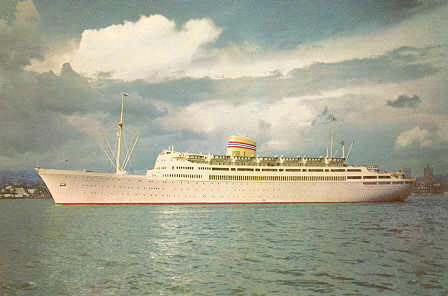 She was renamed Fulvia, and joined Federico C and Flavia on Caribbean cruises. Fulvia retained Norwegian flag and crew. Fulvia caught fire near the Canaries in July 1970, and subsequently sank, all passengers and crew having been saved by the Ancerville. Official NAL postcard E.M.10-63 of Oslofjord (3). 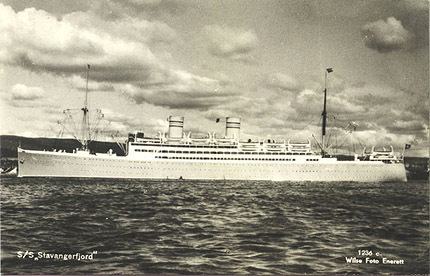 Official NAL postcard E.M.XII-55 of Oslofjord (3). 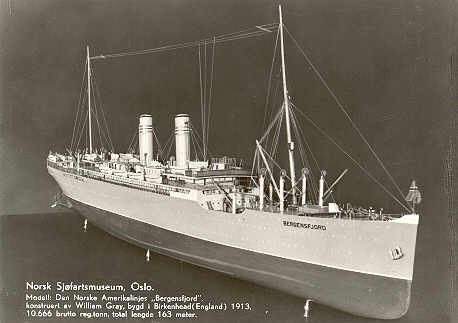 Official NAL postcard E.M.2-57 of Oslofjord (3). 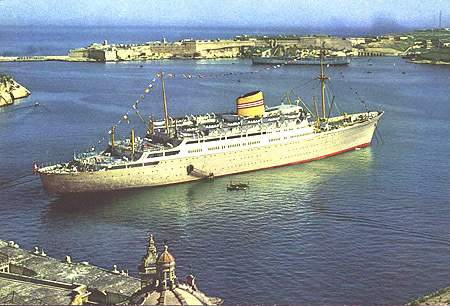 Official NAL postcard 12-61 of Oslofjord (3), at Valletta, printed by Dreyer A/S. Photo by Manugian. Scan: Finn Tornquist. 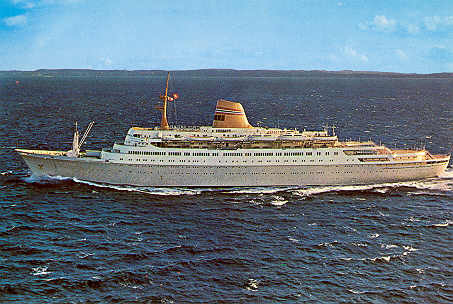 Official NAL postcard of Oslofjord (3), off Helsingor. 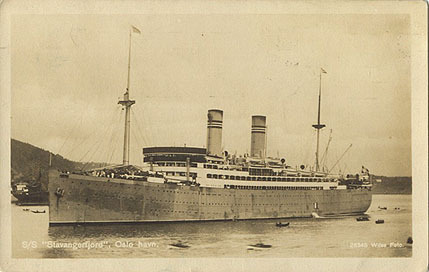 Official NAL postcard of Oslofjord (3) taken off St. Kitts. 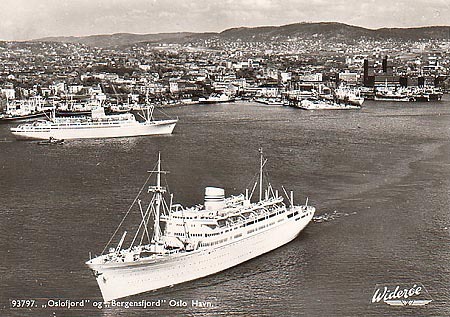 Postcard of Oslofjord (front) and Bergensfjord at Oslo. 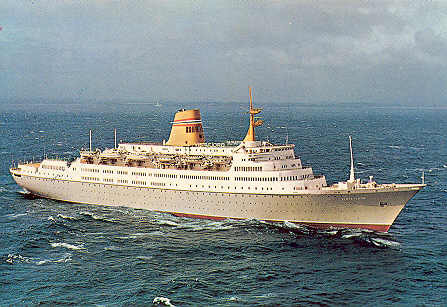 Bergensfjord was completed in 1956 by Swan, Hunter & Wigham Richardson, Wallsend-on-Tyne, Newcastle for Norwegian America Line. She was 18739grt and carried 878 passengers. 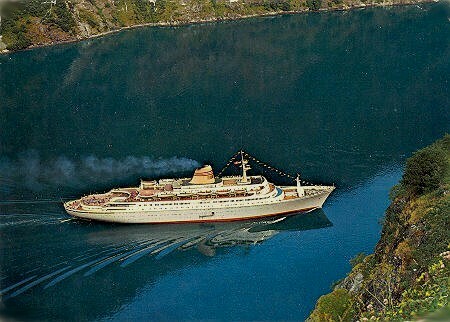 Bergensfjord was acquired by the French Line (CGT) as the De Grasse (2) in haste in 1971 to replace the Antilles which had been lost in a fire. 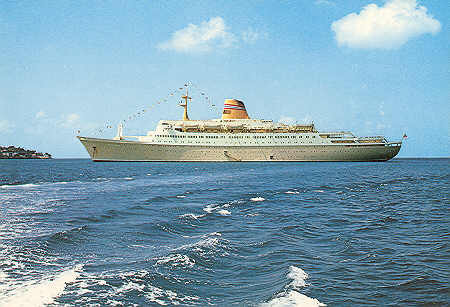 She was not profitable on the le Havre-Southampton-Caribbean service, and spent 1972 cruising. 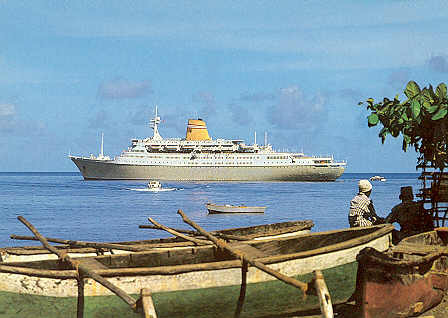 De Grasse (2) was sold in 1973, becoming the Rasa Sayang. 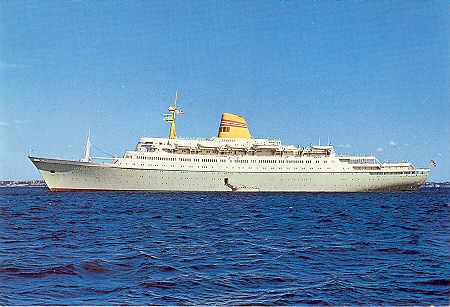 In 1980 she was sold to Aphrodite Maritime Co, Greece. On 17th August 1980, a fire started in the engine room whilst she was under refurbishment at Perama, Greece. She was towed out of the docks and capsized and sank near the island of Kynosoura, some kilometres from Perama. Official NAL postcard E.M.7-60 of Bergensfjord (2). Official NAL postcard of Bergensfjord (2), mailed from Sptizbergen on 26/07/1968. Official NAL postcard E.M.9-69 of Bergensfjord (2). 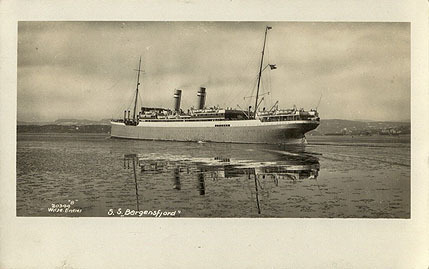 Official NAL postcard of Bergensfjord (2), off Helsingor. Official NAL postcard of Bergensfjord (2). 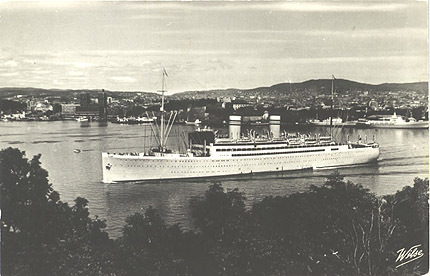 Postcard of Bergensfjord (rear) and Oslofjord at Oslo. 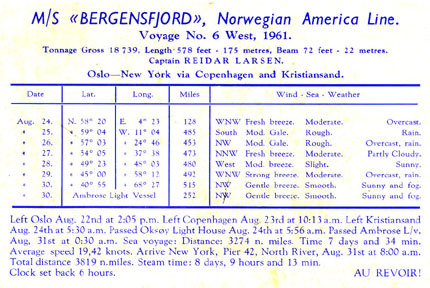 Official NAL souvenir ship's log of Bergensfjord (2), showing the ship's log on the back. Sagafjord was completed in May 1965 by Soc. des Forges de la Méditerranée (La Seyne sur Mer). The builders lost so much money on her construction that they went into liquidation the following year. 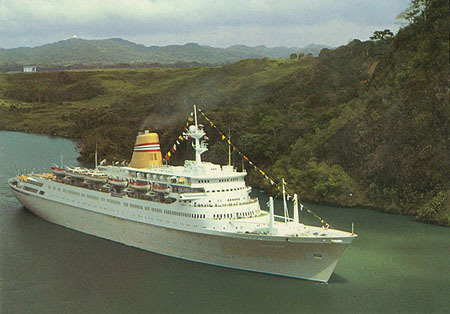 Sagafjord was 24002grt and carried 85 First and 704 Tourist passengers on Atlantic crossings, 462 in one class when cruising. She was powered by two 9cyl Sulzer diesels totalling 27000shp. 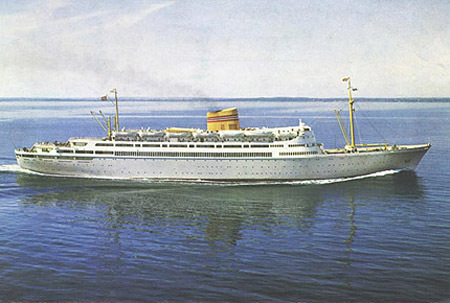 In 1980, Sagafjord and Vistafjord passed to Norwegian American Cruises (NAC), 90% owned by NAL. 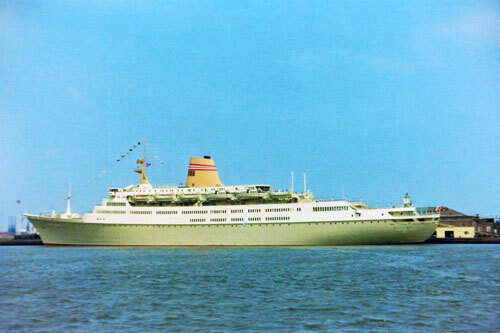 In 1983, Trafalgar House acquired NAC, and the ships joined the Cunard fleet, Sagafjord retaining her name. 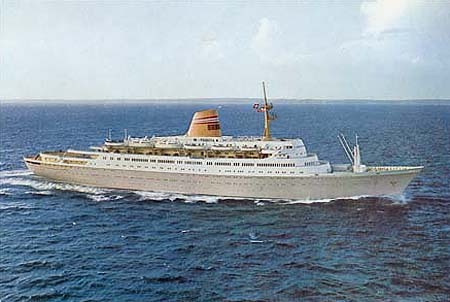 In 1996 was chartered to Transocean Tours as the Gripsholm, followed in the same year by sale to Saga Cruises as the Saga Rose. A complete history of this ship, is available on this link. 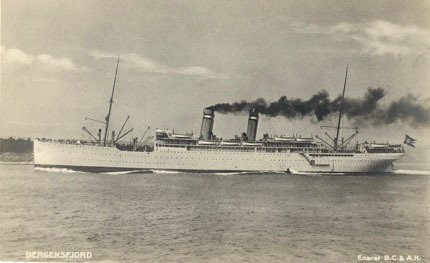 Official NAL postcard of Sagafjord. Official NAL postcard 100M-2-74 of Sagafjord. Official NAL postcard 3/77.30M of Sagafjord. 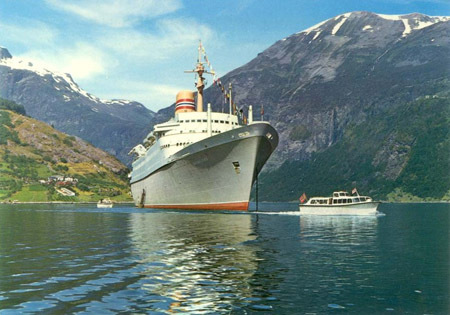 Official NAL postcard 8.8.78.50M of Sagafjord. Official NAL postcard E.M.5-71 of Sagafjord. Official NAL postcard F-4022-9 of Sagafjord. Official NAL postcard F-4023-9 of Sagafjord. 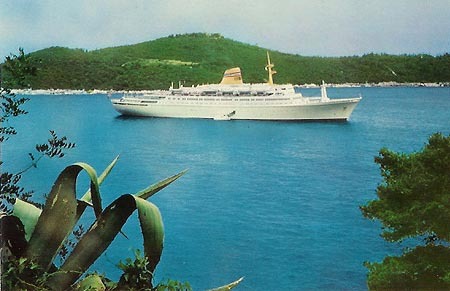 Official Norwegian American Cruises postcard of Sagafjord, following 1980 rebuild. 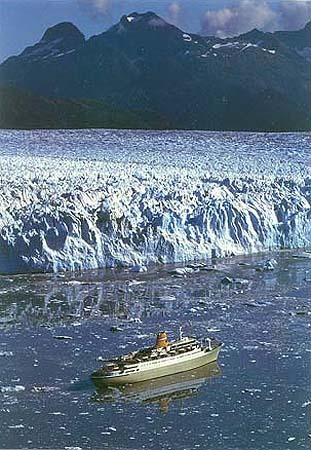 Official Norwegian American Cruises postcard of Sagafjord at Columbia Glacier. Vistafjord was completed in April 1973 by Swan Hunter (Wallsend, River Tyne). 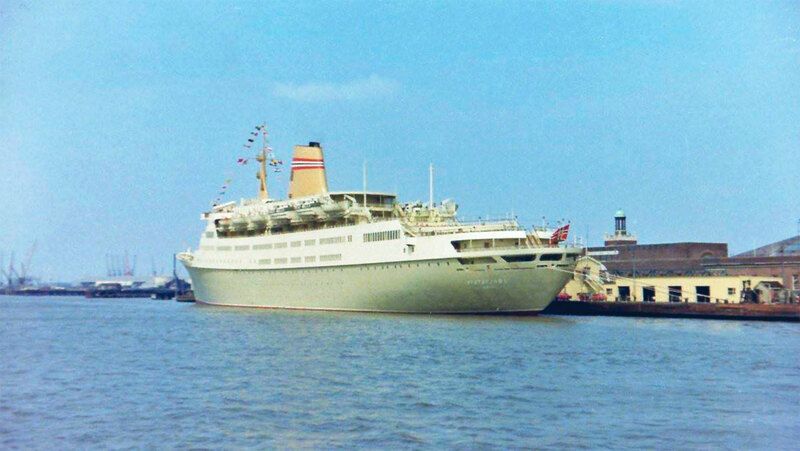 Vistafjord was 24292grt and carried 830 passengers on Atlantic crossings, 550 when cruising. She was powered by two 9cyl Sulzer diesels totalling 24000shp. 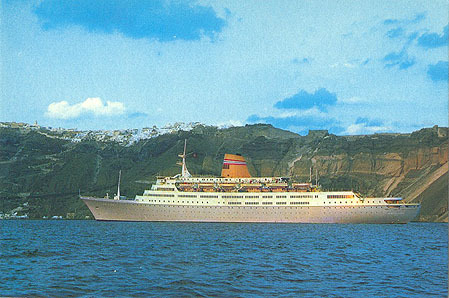 In 1980, Vistafjord and Sagafjord passed to Norwegian American Cruises (NAC), 90% owned by NAL. 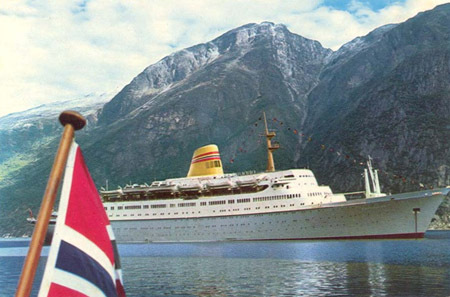 In 1983, Trafalgar House acquired NAC, and the ships joined the Cunard fleet, Vistafjord retaining her name. 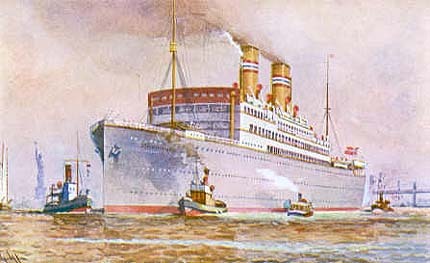 In 1999, Cunard renamed the Vistafjord as Caronia. 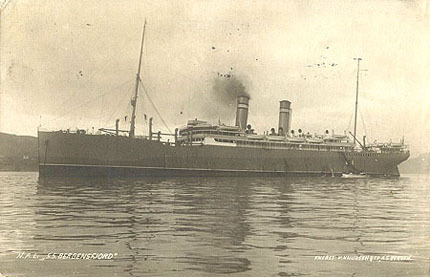 By this time she carried 736 passengers and tonnage had increased to 24492 following additional cabins on the upper deck. 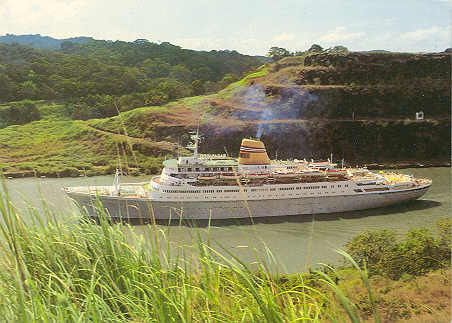 In May 2003, Caronia was reported sold to Saga Cruises, to rejoin her former fleet-mate Saga Rose from 2005. 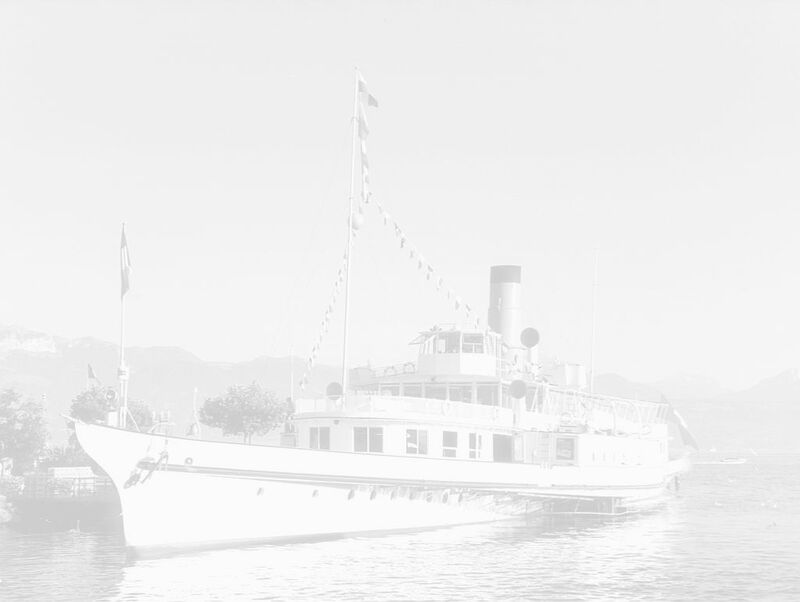 Photographs of Vistafjord and Caronia in Cunard service are available on this link. 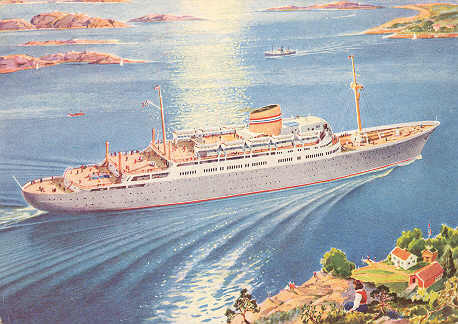 Official NAL postcard of Vistafjord (3). 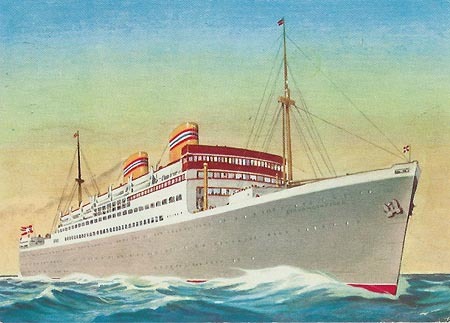 Official Norwegian American Cruises postcard of Vistafjord (3).